When I turned sixteen, I bought a car just one year younger than my then-pimpled self. 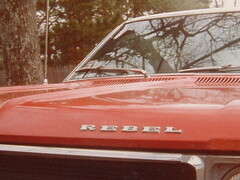 It was a vehicle I knew well, for the 1968 AMC Rebel had sat under my Granny's carport for as long as I could remember. Faded red with a white top, the boxy sedan had two impossibly long doors and gray and black checkered bench seats that folded a-l-l the way back. Though it wasn't the gleaming new RX-7 I fantasized about, I gladly depleted my bank account of five hundred tobacco dollars for this also-ran from another era. My first order of business was to being Granny's old jalopy into the totally awesome 80's. Buying a cheap cassette converter for the car's antiquated 8-track, I cranked up the Oingo-Boingo and rounded up a half dozen juvenile delinquents to help me break in my less than new wheels, Boy, did we. Always happy to chauffer anyone the least bit interested in skipping class, I toured the backroads of Wayne County during all hours of the regulation school day. As a result, my once-promising grades plummetted, just as my status among the smoking-area crowd skyrocketed. I may have been steering a horseless carriage overdue for the pasture, but at least I'd finally arrived. From spontaneous road trips to the beach to stuffed-trunk drive-in shenanigans to outright mailbox abuse, me and my backseat full of derelicts lived just as fast at that old sedan would take us. But like the thrills of adolescence itself, the fun wasn't meant to last. Less than a year into my motorized freedom, a series of bad decisions conspired to rob me of my flying carpet. I'll spare you all the dated details, but let's just say rotten grades, forged report cards and an ill-timed Billy Idol hair-bleach job led me to storm out of the house one Friday afternoon, jump in The Rebel and not look back. That night, I ended up at a slammin' yard party, where I celibrated my emancipation with indulgences I will not detail here. When I awoke around noon the next day, it felt as if the good times had rolled right through my skull and I sought refuge in my less than pimped-out ride. But the damndest thing happened as I rubbed my aching forehead and scanned the field of cars for my faded chariot. I couldn't find it! No matter how I squinted, I didn't see my Granny's old car. By the time I'd searched the ad-hoc parking lot and come up empty, the hair mousse wasn't the only thing making by bleached-out spikes stand on end. "Where's The Rebel? ", I squeaked to a groggy accomplice. "It was right HERE," I said, pointing to an empty patch of grass. "Hell, the keys were even in it..."
Thirty hours later, I found it - parked askew on the shoulder of a country road, not five miles from my parent's home, a place I'd officially run away from two nigts before. Knowing the self-imposed exile had to end, I loked the car over and breathed a huge sigh of relief when Isaw the keys still dangling in the ignition. More grateful for its return than mad at its disappearance, I climbed behind the wheel and told the friend who'd been driving me around that I was going...gulp, home. Two miles down the road, as I searched my brain for an alibi to appease my surely furious parents, a clanking metallic sound rousted me from my windshield coma. Backfiring loudly, The Rebel paused and sputtered, a sickening clicking sound eclipsing the motor's hum. Suddenlyt the engine fell silent and the power steering locked up. I managed to steer it onto the shoulder as it rolled to a final stop. I'm no mechanic, but the acrid smell pouring from beneath the hood told even me that The Rebel was dead. Turning away in grief and disbelief, I began the long walk home. My Granny's old car never recovered, a victim of too much neglect and not enough oil. Though I still don't think my parents believe me when I tell them it was stolen, they made a phone call to a local salvage yard, whose swarthy tow truck driver dragged it to the spot where it still sits today. I've gone to pay my respects a time or two since then, usually peeking through the salvage yard fence and joking to my younger brother about what we may find if we could only pop the trunk. The last time I saw it, tall grass had almost eclipsed my very first ride. That's probably as it should be, but as I approach the Big 4-0 and begin to entertain the idea of a mid-life crisis car, I can't help but think of The Rebel and what might have been. Part of it is The Job. While chasing news can be an exhilarating kick in the press-pass, it can also be a synapses-stifling exercise in hurry up and wait. Couple that with the manufactured frenzy of a ratings period and the thankless nature of playing caddy to the regionally famous and you have a gig that can leave you numb and grumbling just as often as it renders you energized and inspired. On that, I COULD write a book. Lately I’ve been yanked away from my solo gig and partnered with a revolving cast of on-air correspondents. Together we’ve toiled daily on stories that have led their respective newscasts but haven’t exactly enthralled me to the point of on-line examination. If you feel cheated, don’t. Explicit details of eight hour phone tag sessions and minute-by-minute dissections of parking lot stake-outs don’t always make for entertaining fare, no matter how much lyrical mojo I’m packin’ - which lately, ain’t much. But, as I’ve learned over the past year, lack of fodder is just one peril of push-button publishing. For ever night that I rush past the wife and kids to upload images and ideas into my laptop, there will be days (nay, weeks!) like this, when I’m forced to fill paragraphs with calorie-free filler, in hopes that my nine and a half regular readers won’t forsake visiting my site for the pet-photo spreads available elsewhere. Why that matters so much to me is less than a point of pride, but once a struggling writer like myself has gotten a taste of being read, well it also makes up for never having been published. So if you count yourself a regular visitor of this humble blog, do me a favor and don’t be a stranger. The output may fluctuate, the quality may vary, the pictures may grow fuzzy and rare...but rest assured that when I’m not sequestered in my upstairs lair with a burning case of keyboard diarrhea, I’m off somewhere staring into space, wondering what I can write about next and trying not to think about why I insist on doing so in the first place. Next time: Actual content…I promise! In TV News, we're not afraid to tackle the tough issues, like "Hey, what's up with that old trailer on Freeman Mill?" 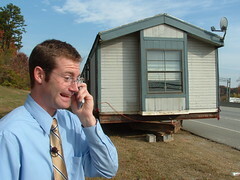 For days, intrepid reporter Eric White has asked himself that very question as he passed the abandoned mobile home sitting in the breakdown lane just North of downtown Greensboro. Today he dragged me along on his journalistic quest, and can I say, 'we owned that story'. 9:45 Whitey and I arrive on scene, circle said trailer and guess at its vintage. While I push the glass, he works the phones. 9:57 Random cyclist pedals by. We jump out from behind the trailer and threaten to jam a stick in his spokes if he doesn't give us his opinion on camera. Seconds later, the 'Record' light shines. 10:13 After shooting more footage than we need, we abandon the manufactured home once again in search of more sound. 10:18 A half mile away, convenience store wino corners us in parking lot with conspiracy theory and halitosis. We shake him and find a trucker who'll talk, even though he didn't 'have all his teeth in'. 10:25 Trucker sound on disc, we jet back to the stranded trailer and wait for the cops to come meet us. 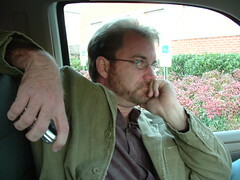 As Whitey makes for his 4,367th phone call of the morning, I doze off behind the wheel. 10:28 I awake with a start as strange men drag heavy chains by trusty Unit 4. Realizing they aren't with the police, we jump out to document their intentions. 10:30 After hovering over the men as they wrapped chains and twisted wrenches, the leader of these trailer-transporting truckers consents to an interview, never questioning why a camera crew is hanging on his every word. 10:32 Leader explains that since they couldn't truck a trailer at night, they'd ditched the old mobile home for the weekend before resuming the trip to Laurinburg today. Unconcerned as to why we care, lead trucker hocks up impressive wad of tobacco spit and waddles off. 10:37 As Whitey and I stand traffic-swept and befuddled, trucker gang pulls onto Highway 220 with trailer attached behind it, taking any need for an investigative follow-up with it. 10:38 Once trucks and trailer drive out of sight, Whitey and I put our toys up and turn our attention to early lunch plans, having worked up a real appetite from all that intensive journamalising.